A team of anthropologists claims to have discovered the remnants of a supposedly ‘30,000 year old’ Neandertal/modern human fossil hybrid. Fossil fragments of a skull, upper and lower jaw, and shoulder blade seem to reveal a blending of Neandertal and modern human features. Study author Erik Trinkaus of Washington University said, ‘At least in Europe, the populations blended.’1 This is exciting news for young earth creationists! This discovery further enhances the circumstantial evidence for Neandertals being fully human beings. 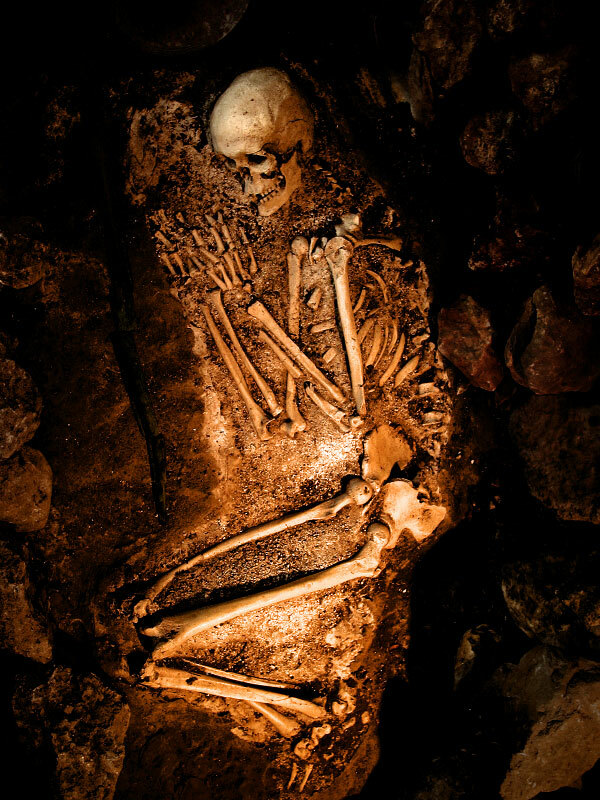 A famous Neandertal skeleton found in La grotte de Clamouse (34000 France). 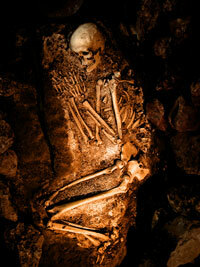 The skeletal remains were initially discovered in a Romanian cave in the 1950s. Because they looked superficially very much like modern humans, they were filed away. That is until Trinkaus and his colleagues decided to reopen the case and take a closer look. Their study compared the fragments with those of modern humans in Africa and Europe. Surprisingly (at least to progressive creationists and other long-agers who try to relegate the Neandertals to a less-than-human status), the Romanian fragments showed a mosaic of Neandertal and modern human characteristics. For example, the skull had an occipital bun at the back of the skull, and muscle attachment scars were present at the back of the jaw. These characteristics, in particular, are very Neandertal-like. In addition, upper jaw, lower jaw, and shoulder blade fragments appeared to reveal a blending of features. This evidence of interbreeding shows that the two groups ‘saw each other as socially appropriate mates’, Trinkaus said. We do not often appreciate the enormous range of skeletal variation in modern humans. Neandertals easily fall within the wide range of skeletal variation that exists in mankind. Creationist anthropologist Marvin Lubenow calls them “varieties of post-flood humans.”3 UK surgeon Vij Sodera considers Neandertals to be fully human, with their characteristic skeletal features arising due to an ice age climate, arthritis, rickets, and genetic isolation. An array of archaeological evidence, such as sophisticated spears and stone tools, the controlled use of fire, building huts from animal skins, making flutes out of bear femurs, and the ceremonial burial of their dead, strongly confirms that Neandertals possessed an intellectual and spiritual capacity like our own. How many of us, without the aid of modern technology or an internet library, could perform these same feats? They also possessed a hyoid bone (in the larynx, or voicebox) that was very similar in shape, size, and position to our own, which means they were capable of fully human speech. At least one Neandertal sample of mitochondrial DNA (mtDNA) appeared to reveal substantial divergence from modern human mtDNA.5 Some scientists considered this clearcut evidence that Neandertals must have been a different species. However, even in the evolutionary community, there is still a firestorm of debate over the modern human-Neandertal relationship based on mtDNA comparisons. Issues such as postmortem contamination, small sample size, enormous mtDNA diversity in non-human primates, effects of population bottlenecks, and molecular clock inaccuracies render a solution impossible at this time. Thompson, Andrea, Humans and Neanderthals Might Have Interbred, Livescience.com, 30 October 2006. Soficaru, A., Dobo, A and Trinkaus, E., Early modern humans from the Petera Muierii, Baia de Fier, Romania, Proc. Natl. Acad. Sci. USA, 10.1073/pnas.0608443103, published online before print 3 November 2006. Return to text. Lubenow, Martin, Lagar Velho 1 child skeleton: a Neandertal/modern human hybrid, Journal of Creation 14(2):6–8, 2000. Return to text. Wieland, Carl, Bones overthrown An interview with human-fossils researcher Marvin Lubenow, Creation 17(4):17–19, 1995. Return to text. Reader, John, Missing Links, p. 232, Collins, 1981. Return to text. Recovery of Neandertal mtDNA: an evaluation, Journal of Creation 12(1):87–97, 1998. Return to text. Moulson, Geir, Neanderthal genome project launches, AP, 20 July 2006. Return to text. E-mail discussion with a creationist Ph.D. (genetics) who has asked not to be ‘outed’ at this time. Return to text. Neandertal remains to date are all found in post-Flood contexts (e.g. buried in caves) and as such would have been descendants of Noah as well. Return to text.